Are you pregnant and in need of help? Why Life Ministries in Alden can help. Click HERE to go to their website and see the services they provide, and how to contact them. For resources in the Buffalo area, contact the Buffalo Diocese Office of Pro-Life activities at 716-847-2205 or click HERE for their website. Are you in need of help after an abortion? There is healing and forgiveness for you. If you are a woman who has had an abortion and need help, please click HERE for help through Project Rachel, HERE for help through Silent No More. If you are a man who has lost a child to abortion, please click HERE for help through the Men and Abortion Network. Did you know New York legislators have introduced legislation similar to Oregon's assisted suicide law? Please click HERE to find out what is happening in the New York legislature. Please click HERE for more news on assisted suicide. Please click HERE for Church teaching and guidance on end-of-life issues. Did you know there is a committee working in Washington, D.C. for a Human Life Amendment to the U.S. Constitution? The National Committee for a Human Life Amendment (NCHLA) is also involved with and reports on other pro-life legislation in Congress. Click HERE to read their current Legislative Report on their website. Also, on the left-hand side of the site, you will find a list of other life issues. Click on each one to read about proposed or current legislation, briefing pages, and links to other sites for more information. The "Action Alerts" tab at the top of the page provides information on legislation being considered regarding life issues and how you can take action. concerning the greatest human rights violation of our time, legalized abortion on demand. Aware of Winter Storm Jonas forecast to hit the east coast, 18 pilgrims from St. John's departed the morning of Thursday, January 21 on the diocesan bus to Washington, D.C. with the hope of marching the next day. Our plans were set: Thursday afternoon/evening our Youth Group would tour the Saint John Paul II National Shrine, eat a Chik-Fil-A box dinner on the bus and drive to George Mason University where we would attend the "Life is Very Good" Evening of Prayer. Friday morning, we would attend Mass at the DC Armory with Bishop Malone and other Youth Groups from Buffalo, then go to the Washington Monument for a rally beginning at noon. 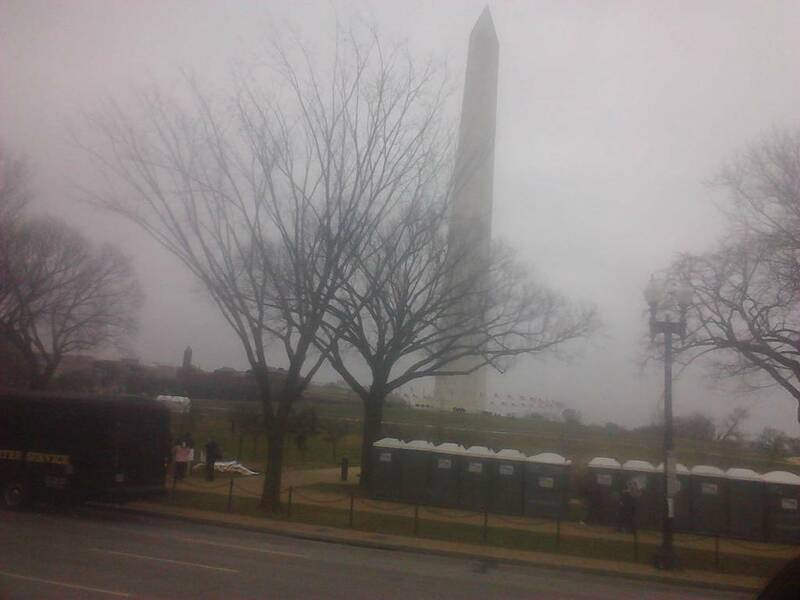 The March would begin from there, heading east along the National Mall and ending at the US Supreme Court building. Normally, the arena would be full. The empty seats were evidence that many groups had cancelled the trip due to the weather forecast. But we hearty Saint John's pilgrims enjoyed the show! Friday morning we gathered in the hotel lobby at 7am, ready to go when we learned that plans had changed and we were to stay put while final decisions were made. Decisions were made: we would attend the Buffalo Diocese Mass at the hotel, board the buses at 10:30 and head out of town by 11. We were all disappointed, but understood that those responsible for our well-being wanted us to return home safely. Mass began, with several diocesan priests in attendance. Instead of arriving home at 3 am, we pulled into St. John's parking lot at 9 pm, so that was a positive result of missing the March for Life 2016. I'm already thinking of next year's trip!! Why don't you come along? St. John's Respect Life program was founded by the late Norman Geiger in the mid 1970s. Mr. Geiger and Mr. Joseph Blind devoted themselves tirelessly to the great cause of life. The work of the founders continues by sharing information about the sacredness of life from conception to natural death. Frequently, literature is made available in the entrance of the church. Here is some of the great work our organization has been doing in the past. 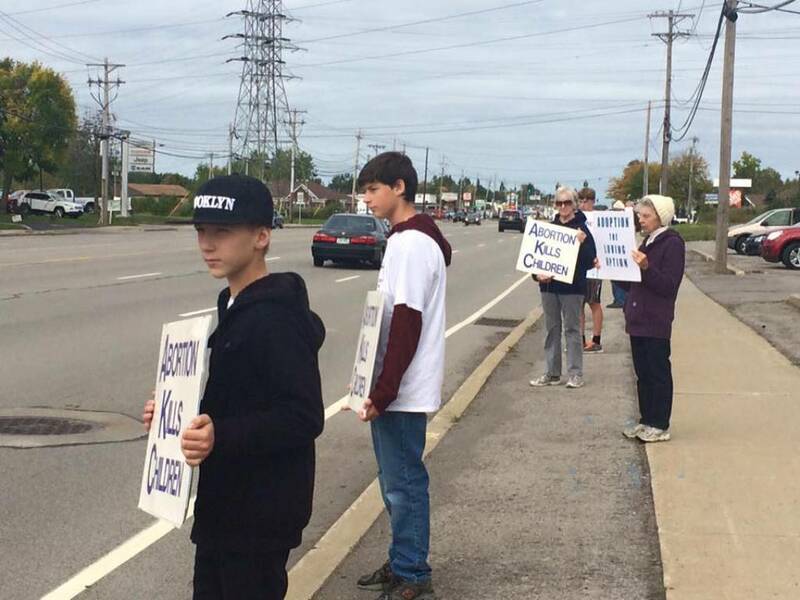 Members prayerfully and peacefully join others in a National Life Chain on Niagara Falls Blvd holding signs that state "Abortion Kills Children." 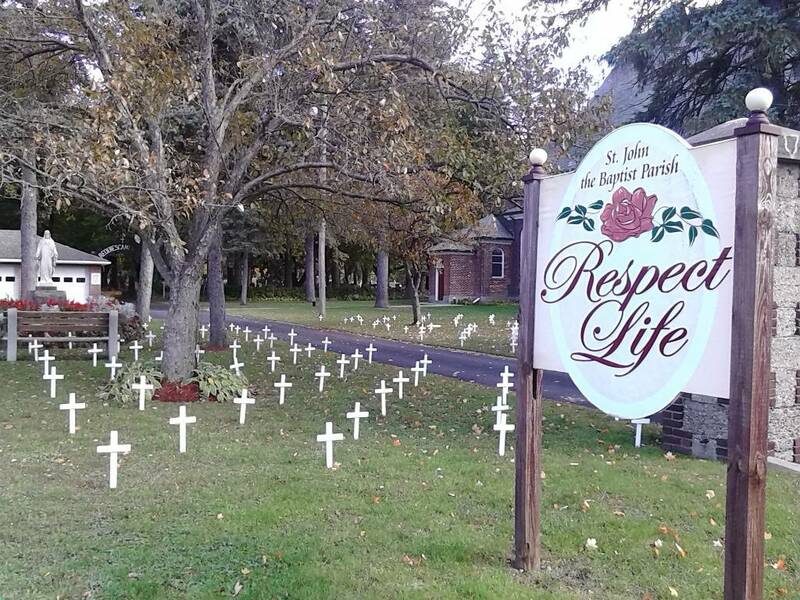 In the fall of the year, the Cemetery of Innocents is constructed between the church and the rectory displaying approximately 330 crosses (the average number of abortions performed in New York State each day). Prayer in the Park In June. We also send mailings to our elected officials voicing our concerns about government decisions in the area of LIFE. Please join us in praying for a world where human life will always be loved and defended. 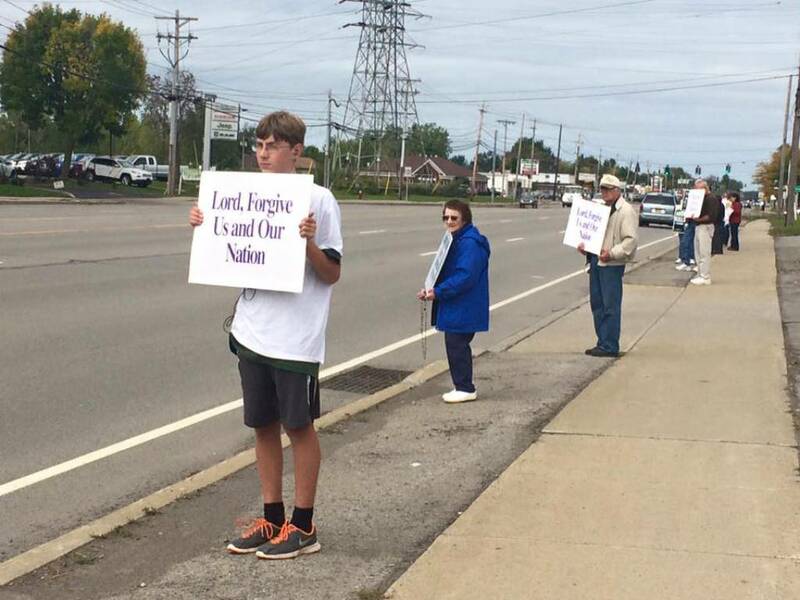 For the Respect Life Calendar of Events, click here. Lord God, I thank you today for the gift of my life and for the lives of all my brothers and sisters.